Interest from UT, UGA, UF, ND, etc. 6'5 290 at what 15? Wowsers. Sure is. Gotta figure out how to keep it instate. Lots of work to do. Let me guess, he didn't grow up a Vol fan....? Good god. 14 years old? I ain't gonna piss him of off. You can if you want but I ain't gonna. "Tucker grew up a TN fan"
"Been in NPA since 7th grade. He and rising frosh Jake Wray are better than 95% of high school OL right now. He was very impressive at NPA camp last week and all the college coaches raved about him. He and his family are big UT fans. But he is a great prospect so that won't stop big time programs like LSU from taking their shot. Tuck and Jake Wray are going to be legendary." Who would if they were born in 2000s and have only witnessed Tennessee battle the likes of Kentucky and Vanderbilt to stay out of the SEC east cellar? Folks need to realise Tennessee football has been a joke for most of these kids lifetime. Who would? This kid, for one. Lots of others apparently. Plenty of data contradicting you on this. Is Jake Wray the younger brother of Max Wray? The thing about kids is they have parents. And grandparents. 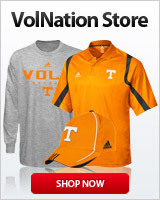 I know it's a crazy concept for you to understand, but kids can still be Vols fans even though we've sucked for 10 years. If they're anything like me, it was ingrained into them as a small child by their parents and grandparents who would have never let them grow up anything but a Vols fan.